We are your local Tax Preparation Specialists located at the Downtown Silver Spring, Maryland (Fenton Street). 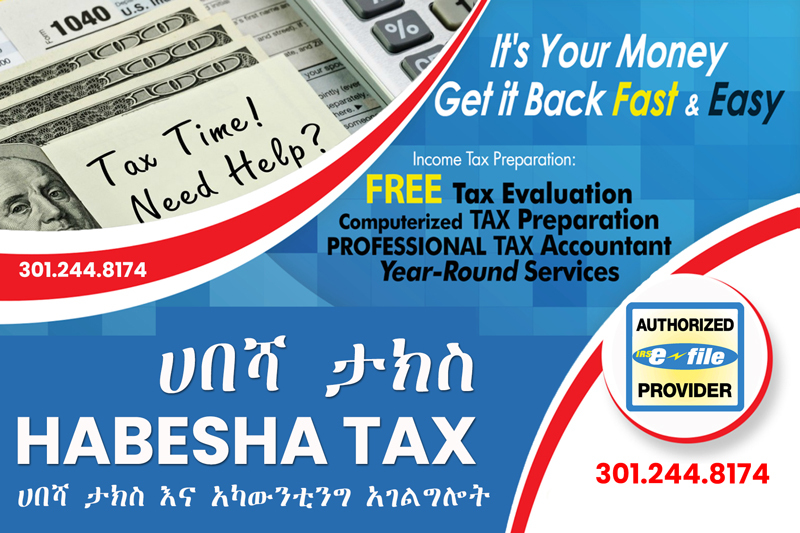 Your Tax Professionals at Habesha Tax are committed to you and exceeding your expectations. The HabeshaTax team brings diverse experience and a unique approach to ensuring the highest level of service. We pay attention to Each and Every detail in order to Maximize your Tax Refund and Minimize your Tax Liability! Get the Fastest Tax Refund Possible with Electronic SAME DAY Refund Filing! Guaranteed Maximum Tax Credits. Unlimited Amendments of Past Years’ Returns…we make sure that your past tax returns were done accurately! Direct Deposit: E-file your return with a direct deposit to your bank account. Visa Credit Cards: HabeshaTax will provide you with a Visa Credit Card and apply your refund amount.